The King's Blood is book 2 of Abraham's trilogy The Dagger & The Coin, and sequel to The Dragon's Path. In that book's review, I lauded Abraham for his engaging, character-driven approach to epic fantasy, while criticizing the empty geography and underdeveloped 13 "races" of humanity he introduces us to. 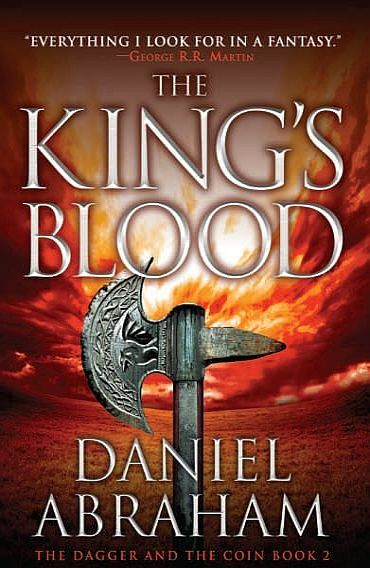 The King's Blood picks up right where it left off, and for the first 2/3 of the book at least, possesses all the same charms and drawbacks of its predecessor. This very much includes the lack of "epic" events in favor of more intimate, relationship-driven drama, which may turn some readers off, but which I find refreshing in a genre filled with cataclysm and cliche. It was with some disappointment, then, that I reached the pivotal moment of The King's Blood, the point beyond which "nothing will ever be the same again...ever!" If my attitude strikes you as weird, let me elaborate. But first, let me change font color so that those who want to avoid the mild, though inevitable, spoilers can skip past. So here's the problem: now that we're a good 900 pages into the series, we have a pretty good idea of what the characters are like. Dawson is an unbending patriot and arch-conservative; Clara is his dutiful wife; Cithrin is a young, talented banker who is also probably an alcoholic; Marcus is a gruff but caring war veteran who sees Cithrin as a surrogate for the daughter who was murdered; and Geder is an affable, bookish sort who backpeddles into a position of power and is prone to making arbitrary decisions--including one to massacre the city of Vanai--based on moments of personal humiliation. Now, though, our characters begin acting in ways that don't fit into what we know about them. Geder in particular suddenly takes the fast track to Stalinhood, while Cithrin magically transforms from a clever but still raw banking prospect in a small city to a master of political intrigue in a foreign capital. Making matters worse, the situation itself is dubious. Palliako's rise is at least partially attributable to Dawson's personal complicity in the intrigues that lie at the heart of The Dragon's Path. With those settled, you'd think this close childhood friend would return to his rightful place at the side of the king. But no--when Simeon dies, Palliako--not Dawson--is named Lord Regent. This makes no sense. The introduction of Cithrin into this storyline is also problematic. When things come to a head, she seems to know what to do and how to do it better than people who have a) lived at court their whole lives; and b) lived in Camnipol their whole lives. This also makes no sense. There are other problems as well. We still don't get enough sense of geography, and the 13 "races" are still underdeveloped. Plus now we have way too much Clara. Abraham was probably going for something along the lines of Catelyn Stark, but Clara lacks her depth and authenticity, coming off instead like the Lady of Winterfell's cardboard cutout. This stands in sharp contrast to Abraham's other characters, who are complex and relatable. It's not a "male author can't write female characters" thing, as Cithrin is probably the best-developed character in the whole series. So yeah, not sure what's going on there. All that said, The King's Blood is still a good read, and I am still looking forward to the final installment (which I hear is in the editing phase already). Abraham's prose outshines most others working in fantasy, and he's got a knack with characterization--the two most important elements of writing. Plus things are set up well for a return to form in book 3. Bonuses: +1 for the unusual, small-cast intimacy; +1 for a good setup for book 3. Penalties: -1 for all the "gee that's really convenient, isn't it" moments; -1 for excessive Clara; -1 for Cithrin's ultimately unconvincing superpowers. Final Verdict: 6/10. "Still enjoyable, but the flaws are hard to ignore"